Holiday music, shopping, parties, eats, eggnog, snow, lights and trees about. It’s that time of year. I had a chance to checkout the holiday scene in Detroit this week when attending a holiday party at Fountain Bistro, a recommended restaurant stop within Campus Martius park. 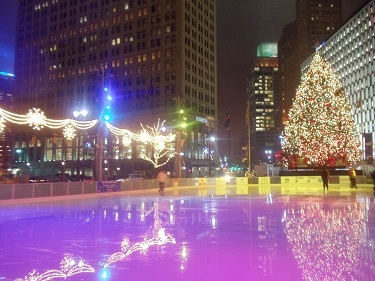 Campus Martius Park, right in the heart of downtown Detroit, happens to be where the 60 foot city holiday tree sits, sitting atop the Woodward Fountain. Alongside is an ice skating rink with holiday music playing. There are holiday lights up everywhere around the park and surrounding area. People were ice skating, staring at the tree and presents underneath and soaking in the holiday atmosphere and walking around taking pictures. The only thing missing was snow or at least flurries. It was actually raining a bit. It was a great party and great evening spent in the big city in a festive atmosphere. As far as other cities go, at the top of my bucket list holidays edition would be the Rockefeller Center Ice Skating Rink and New York City in general. What cities would you suggest checking out for lights, trees, ice skating rinks and holiday fun? I’d like to wish everyone a safe and happy holiday season. Cheers! 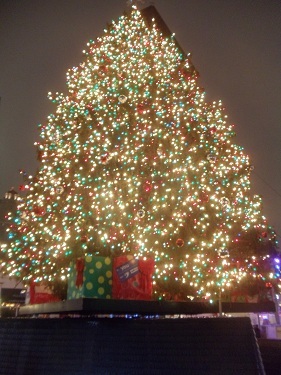 This entry was posted in Detroit, Road Trip, travel and tagged Detroit, Detroit holidays, holiday tree, holidays, ice skating, Michigan, parks, PureMichigan. Bookmark the permalink. Thanks Mike! Your welcome. Hope to make it back down there during the holiday season. Yes indeed, love this time of year! So festive everywhere. Thank you! A great scene down there, very festive. Happy Holidays to you too! Great pictures! 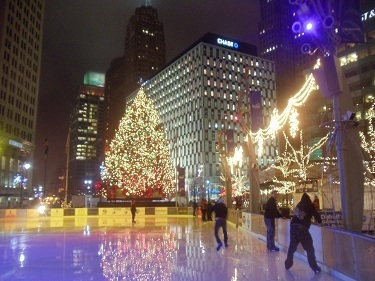 I’ve never been to Detroit; it sure is pretty at Christmas. Happy holidays to you! Thanks Leah! It’s a great festive scene they set up right in the heart of downtown. Lots of people about. Happy Holidays to you too! Beautifully captured, Aaron. Good job.